I could not find the date, but she lived from 1844-1910, so it is most likely safe to assume she painted this in the second half of the 19th century. The composition of this painting was rather intriguing to me because it is such a tight crop and the viewer is not able to see the full body of any of the figures. This makes for a rather mysterious setting as far as what these women are doing. The lighting does a beautiful job of emphasizing the folds on the clothing, and it also highlights the faces of each of the figures in the painting. The contrast of the red/orange dress on the black dress draws the viewer's eye to the left side of the painting. The change of direction in each of the women's gazes helps the viewer's eye jump from woman to woman. I would not expect the title of this painting to be War, and that was another reason I chose this painting. This painting shows the other side of the war, and by other side, I mean the women who had to sit at home and wait for their loved ones to return safely. It is a side of war that most people do not currently think of, so I would imagine that it was thought of even less during this time period. I find the expression of the central figure rather interesting. She is the only one making eye contact with the viewer, and that makes her stare very powerful and strong. 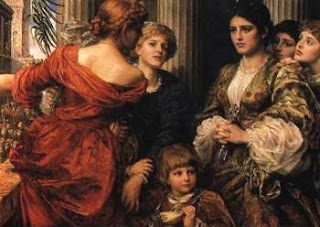 The other women seem to have expressions of either hope or worry on their faces, whereas the central woman's direct stare comes across as confident. To me, she seems to be confident in herself, in her soldier, and in her country. It almost seems as if she would be saying, "I may not be a man, but I could go out and fight for what is right in my country if given the chance." Since she is, in my opinion, the main subject, I feel as if this painting sends a rather liberating message to women, especially for that particular time period. From what I could tell, it was completed in 1883. Good choice! Try to avoid the language of photography (eg., "tight crop") it's a bit to specific and tends to evaluate the image from a base of photographic norms rather than (eg. what makes a photograph "good" is NOT the same thing as art, or even art photography) instead you could say, the figures are seen in medium close-up, or the figures are crowded into the foreground of the composition. Aw you may be aware, the figur in red is meant to represent War: as a goddess, as a force of nature, you're right that it's VERY interesting that War is thus alluded to as a feminine principle.